Mari and Ziggy here!!! :We invite you to listen to our very first live broadcast of 2BrightKidz. 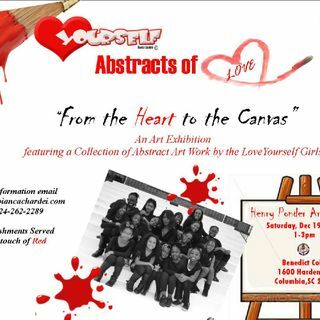 Today we are broadcasting LIVE at Bianca Chardei's LoveYourSelf Abstracts of LOVE "From the Heart to the Canvas" Art Exhibit. We will be playin our favorite Christmas songs and interviewing our peers about their art work and what plans they will have for the Christmas Holidays. Oh and yes Groawnups are allowed and if you cannot make it to the Henry Ponder Fine Arts Center at ... See More Benedict College feel free to gather your kids to listen to the worlds NEW KIDS SHOW!!!! We are taking the world by surprise!! !Shout Out to our Producer my dad...Host/Owner/Creator of House of Harley Radio....You know who he is!!! !2BrightKidz LET'S Go!! !